This year we started raising bees, thanks to the help of our good friend Hossein. Hossein has his own bees and has been nice enough to help get our hives started. We call him Hossein Honey Bee. He is a bee whisperer! We’re excited about our hives – not only do we all love honey, but there are several health benefits to eating raw, local honey. Local bees make honey by collecting pollen from nearby local plants. Since many seasonal allergies are caused by these very plants, eating honey which contains pollen from these plants can possibly combat allergies. This theory is supported by immunotherapy research as well as early research in the area of trace-exposure to allergens in order to desensitize the allergy-sufferer. Furthermore, a component called quercetin is found in honey, which has anti-inflammatory properties when ingested. Quercetin relieves pollen allergy symptoms by stabilizing the cell membranes which release histamine (histamine is the compound that is released by your body in response to an allergic reaction). One of the great benefits of raw, local honey is that it is clean, unprocessed and pure honey. It has not been heavily filtered and has no additives. By contrast, most honey found at major retailers has been pumped through layers of filters, followed by a standard, widely used process of removing all the pollen. Studies have found that a daily dose of honey raises levels of disease-fighting antioxidants in the blood. 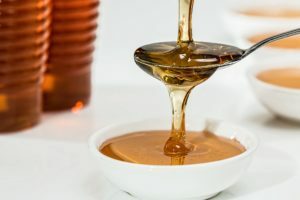 Honey contains polyphenols, which are powerful micronutrients that help to reduce the risk of cancer and heart disease. Raw honey contains these compounds (pasteurized honey does not). Raw honey is rich in nutrients, containing natural vitamins and minerals promoting better health. Minerals found in honey include calcium, copper, zinc, sodium, potassium, magnesium, manganese, phosphorus, and iron. The vitamins found in honey are B6, thiamin, niacin, riboflavin and certain amino acids.